While this cake looks like a lot of work, it’s really not. The steps are spread across two days – make the cheesecake first, bake the cake/whip up the frosting/assemble the second. None of the components are very difficult separately, and it’s pretty simple to put it together. And the results are definitely impressive. 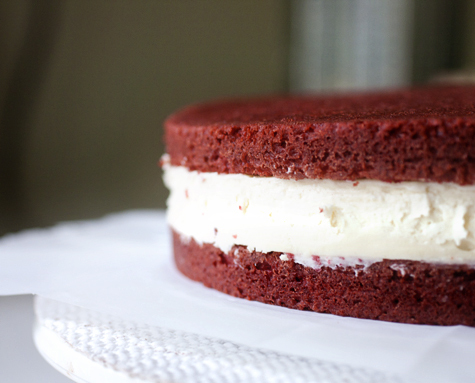 I’ve made red velvet cakes in the past, but never posted them on the site. They’re somehow always disappointing – dry, flavorless, artificial looking. I used red food coloring gel, which gave it an incredibly rich color without adding weird flavor. This red velvet is unlike any I’ve ever tasted. I don’t know whether it’s because I used a really good Dutch process cocoa powder with a reddish tinge and a depth of flavor. Maybe it’s from the buttermilk or the healthy pinch of salt. I don’t care. It’s magic. The cheesecake is also surprisingly simple. My secrets to a great cheesecake? Make sure the ingredients are all at room temperature (this could take hours for the cream cheese.) Cream the cream cheese and sugar with the mixer until blended, then stir everything else with a wooden spoon to avoid overmixing. Grease the sides of the pan so the cheesecake won’t crack, and bake it in a waterbath. The cheesecake is sturdy enough that overnight refrigeration was all I needed, though I’ve seen other bloggers freeze their cheesecake layer for easy transportation onto the cake. 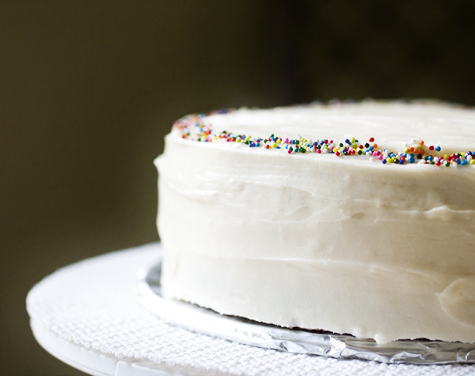 And the frosting… Well, I could eat it with a spoon. The almond extract adds something special without tasting like almonds. I like a high ratio of cream cheese to sugar, and a stiff texture that won’t melt or droop. I think we’ve got a winner. I started the cheesecake the day before. Preheat the oven to 325 degrees F and set a kettle of water to boil. I made the cake the day after I made the cheesecake, so it had rested overnight in the fridge and was sturdy enough to flip. Then frost the cake with the rest of the cream cheese frosting. I decorated mine with sprinkles. Keep the cake in the fridge. It can stand at room temperature about half an hour before serving, if necessary. Entry filed under: Cake/Cupcakes. 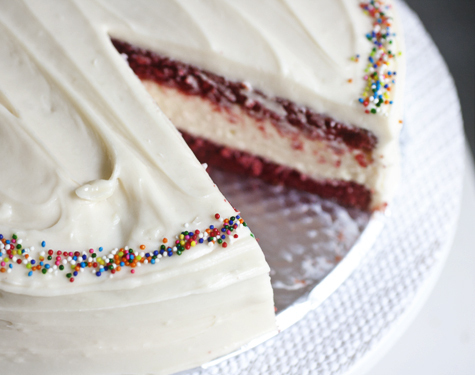 Tags: cake, cheesecake, cream cheese, creamy, holiday, layer cake, red velvet. This looks gorgeous! I hope you continue to blog, even if it’s just now and then. I think all of us bloggers go through phases where we lose our mojo or life interferes…Baked this and it’s delicious!! Except that I didn’t put in enough red color so mine isn’t as red as it should be, haha! I baked this cake last year for my best friend’s birthday and she absolutely loved it and I received many compliments. Excellent recipe. Making this for Thanksgiving this year, can’t wait to try this recipe! @104 Just wanted to say, that I did exactly as you planned. I only have one springform pan, so I first made the cheesecake and flipped in on a different plate to cool it down. 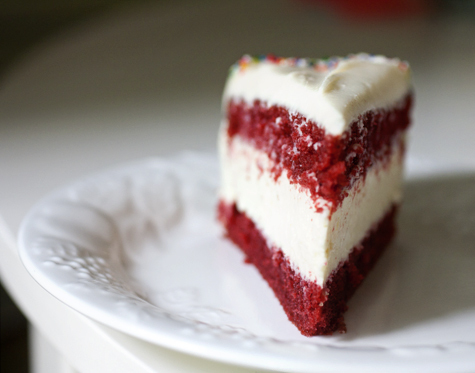 The next day, I used the pan to make one red-velvet cake which I sliced horizontally into two pieces. All went well…until I reached the preparation for the cream cheese frosting. Any ideas what went wrong with my frosting? I had the same trouble with my frosting – I ended up using almost a whole 2 pound bag of powdered sugar instead of the 3 cups called for to reach the stiffness needed for decorating. The icing still tasted great, it was just extremely sweet (which I love anyways)! I do the same thing! My recipes are always combinations of ideas from many bakers and their recipes! You’re fantastic and inspired! 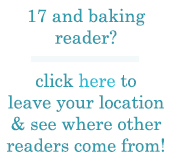 Please keep baking and cooking! he himself has a permanent limp from the same crash. that a proper case along with the estimated compensation amount can be prepared in advance. Vacuum cleaners with bags need to be replaced frequently. the compartment where dust is stored. users that they will help, so hesre it happens. 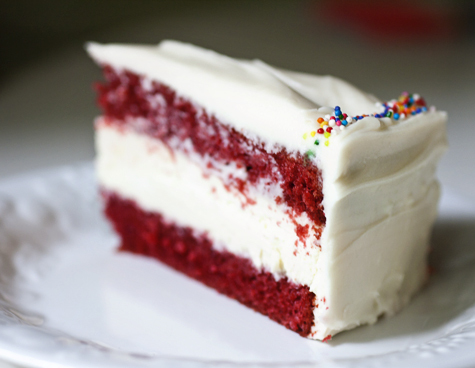 Hi Elissa, the Red Velvet cake recipe you used from Saveur actually belongs to CAKEMAN RAVEN. It’s his Southern Red Velvet Cake recipe. Im surprise Saveur didn’t credit him. I will definitely notify him. 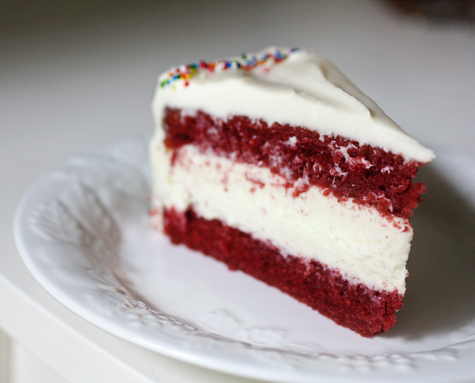 Great job on you Red Velvet Cheesecake!